How many children will there be in 2100? What percent of adults in the world today are literate – can read and write? What’s the worldwide average life expectancy? There are 7 billion people in the world today. Of the maps above, which one do you think shows best where they live in the Americas, Europe, Africa and Asia? The correct answers is: Map B. We have rounded the numbers to simplify this question, but the precise UN estimates are: The Americas: 0.98 billion; Europe: 0.84 billion; Africa: 1.1 billion; and Asia: 4.3 billion people. This slideshow presents the second Test Question from Gapminder Teach: Where do people live? 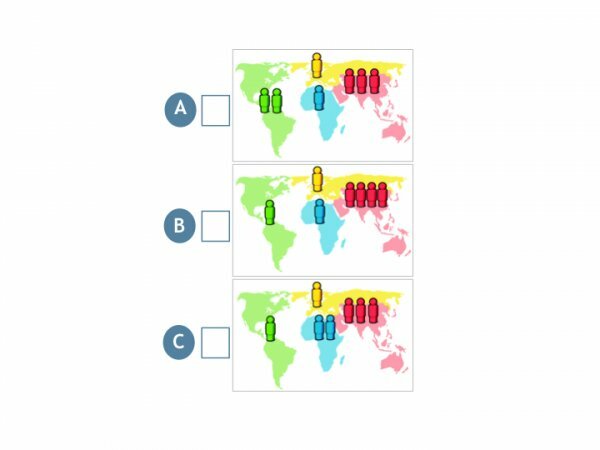 This question seeks to understand the public’s perception about the distribution of the world population in the four world regions. Green represents the Americas (North, Central and South Americas together); blue is Africa, yellow shows Europe; and lastly pink represents Asia and Oceania. Each dummy represents 1 billion people. The slideshow shows the Test Question and the three alternatives with maps to choose from. The third slide shows the correct answer. The last slides present the results from our public surveys, which show that the majority of people we ask are wrong about the billions. The people in all countries we have tested scored worse than chimpanzees. Use this test question in your presentations to test if people know the basic distribution of people on earth. This is so basic, nobody with opinions about world politics should put a billion people on the wrong continent. Yet our public survey shows that the majority of people we ask are wrong about the billions. This presentation is freely available under Creative Common Attribution License 4.0, which means: Please use it and spread it in any way you want, but please make clear to others the license terms of this work and include the citation below.